Moreover, his seven surviving comrades in the field roundly criticized York's description of his role in the action. For instance, in a reply to Liberty magazine's serialized publishing of York's war diary, Cpl. Otis B. Merrihew maintained it was he, not "Corporal York," who accepted the surrender of the 132 Germans. Feeling denied proper credit; he wanted to set the record straight, for he believed that each survivor deserved recognition for heroism. One might conclude that it was the 'fog of war' that was the precipitate cause of the brouhaha over York's Congressional Medal of Honor. And perhaps, that's what it was, but there was no fog surrounding Samuel Dreben not getting his Medal of Honor. It's just inconceivable that the American army saw a Distinguished Service Cross in Dreben's action, while at the same time the French army saw Dreben's conduct worthy of its highest military award, the Medaille Militaire. Dear reader, it's never too late to right a wrong. What needs to be done is for you to forward this article to your Congressman and ask for his/her help. (Congress can order the Pentagon to review Dreben's record.) Also, if you are a veteran please get in touch with the National Museum of American Jewish Military History, e-mail: nmajmh@nmajmh.org and forward this material. Silence in this matter is acquiescence to the injustice! Company G, 328th Infantry Regiment, 82d Division, A.E.F. The Distinguished Service Cross is presented to Bernard Early, Corporal (Acting Sergeant), U.S. Army, for extraordinary heroism in action near Chatel-Chehery, France, October 8, 1918. When in command of a party of 17 men Sergeant Early flanked a German battalion. Upon being suddenly confronted by about 200 of the enemy, Sergeant Early decided to attack despite the disparity of numbers. 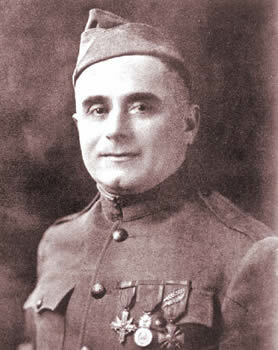 By his quick decision and excellent leadership Sergeant Early effected a successful surprise attack, which he led and commanded until severely wounded by enemy machine-gun fire. The conspicuous gallantry and outstanding leadership on the part of Sergeant Early so inspired the remainder of his small command that it continued the attack until the enemy battalion was either killed or taken prisoner. YORK, ALVIN C., Rank and organization: Corporal, U.S. Army, Company G, 328th Infantry, 82d Division. Place and date: Near Chatel-Chehery, France, 8 October 1918. Entered service at: Pall Mall, Tenn. Born: 13 December 1887, Fentress County, Tenn. G.O. No. : 59, W.D., 1919. After his platoon had suffered heavy casualties and 3 other noncommissioned officers had become casualties, Cpl. York assumed command. Fearlessly leading 7 men, he charged with great daring a machinegun nest which was pouring deadly and incessant fire upon his platoon. In this heroic feat the machinegun nest was taken, together with 4 officers and 128 men and several guns.